A good many individuals, including fire personnel are not aware of the complete significance of the eight points on the Maltese Cross. Here they are: The Maltese Cross, depicting the meaning and importance to fire fighters of the six points. From the days of the first crusade, the cross has been the symbol of the Christian warrior who pledged not only to fight in defense of the Holy Land, but also to protect the lives of his compatriots. The Maltese Cross now worn by modern firefighters is actually an adaptation of a particular crusader insignia, the cross of the Knights of St. John of Jerusalem... The Knights, one of the oldest orders of warrior monks that fought for Christendom, took vows of poverty, chastity and obedience. Also known as Hospitallers, the monks maintained a hospital for pilgrims in Jerusalem. Then that city became the centre of the crusade-embattled lands, the brothers militarized their order, but continued to protect pilgrims and extend their charity to the sick and poor. Because of the extensive armor that covered their bodies and faces, the Knights were unable to distinguish friend from foe in battle, so the need for an identifiable emblem for the Knights became crucial. Since they fought their battles for a holy cause, they chose the Cross of Calvary, a white or silver cross on a dark background. After the fall of Jerusalem in 1187, the Knights of St. John moved to the island of Malta. During the crusades, many Knights became firefighters out of necessity. Their enemies had resorted to throwing bombs and sailing war vessels containing naphtha. Hundreds of Knights were burned alive. Others risked their lives to save their brothers in arms from dying painful fiery deaths. Thus these men became our first firefighters and the first of a long list of courageous firefighters. Their heroic efforts were recognized by fellow Crusaders who awarded each hero a Badge of Honor ; a cross similar to the one firefighters wear today. The Maltese Cross is your symbol of protection. It means that the firefighter who wears this cross is willing to lay down his/her life for you, just as Crusaders sacrificed their lives for their fellow man so may years ago. 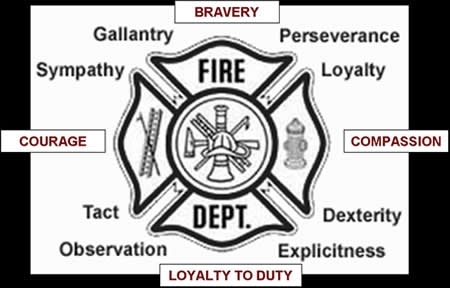 The Maltese Cross is a Firefighter's badge of honor, signifying that he/she works in courage... a ladder-run away from death. Many thanks to the Lawrence Township Firefighters Association at lawrencefire.com for the use of this. All Rights Reserved.